BM120C and BM200C are digital versions of, respectively, the BM120M and BM200M analogue barrier, created by merging microwave circuits of the BM120M/BM200M barriers from AVS ELECTRONICS S.p.A., an Italian company, with a digital signal processing module developed by STEKOP SA. The use of digital signal processing in the BM120C/BM200C barriers constitutes a completely new quality, as compared to classic analogue barriers. High reliability of intrusion detection and improved immunity to false alarms of the BM120C/BM200C digital barriers is achieved by an advanced analysis of signal shape and duration, as well as automatic tracking of changes of environmental conditions. Moreover, it is possible to monitor the operation and configuration of barriers remotely. Single microwave barrier is formed by two modules, the transmitter (Tx) and the receiver (Rx), configured for operation in one of five channels. With properly selected operating channel numbers, it is possible to create arbitrarily complex perimeter security systems based on the BM120C and BM200C microwave barriers, where the transmitterreceiver pairs of microwave barriers do not interfere with each other. The capability of connecting them to a two-wire RS485 bus dramatically simplifies wiring of the entire system, improving its reliability and reducing the costs of installation and servicing. Microwave barrier systems including up to 400 BM120C/BM200C pairs can be managed from the ULISSES Integrated Security System. A service program allows for remote monitoring of operation of the microwave barriers, observation of shapes of activating signals, and defining the minimum and maximum duration of activation, as well as the alarm threshold. When the barrier fails to detect intrusion or generates false alarms, there is a possibility to read the activation shape from the non-volatile memory and subject it to an independent analysis. The recorded signal can also be submitted to the manufacturer in order to develop a dedicated algorithm for signal analysis that would take into account characteristic features of this signal. The process of updating the software of the BM120C/BM200C microwave barrier is performed remotely at the level of service bootloader, and involves sending a new image of barrier controller memory to the device. 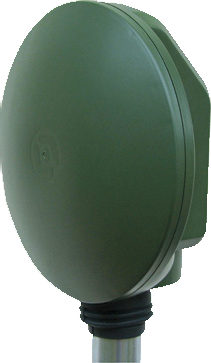 The BM120C and BM200C microwave barriers are assembled in enclosures capable for being installed and used outdoors. The design of enclosure and protective coatings of printed circuits provide long-term resistance to environmental conditions, whereas built-in heaters enable the devices to operate in the entire range of ambient temperatures specified by Defence Standards.